I recently presented a report to the Watershed Committee on the district’s fisheries activities during 2012 and 2013. These activities include monitoring, habitat enhancement, and collaboration with the many agencies and organizations working on salmon restoration for Lagunitas Creek and other coastal watersheds. Our monitoring is rigorous and we are now part of a state-wide effort for life-cycle monitoring, tracking salmon population trends in coastal streams throughout California. 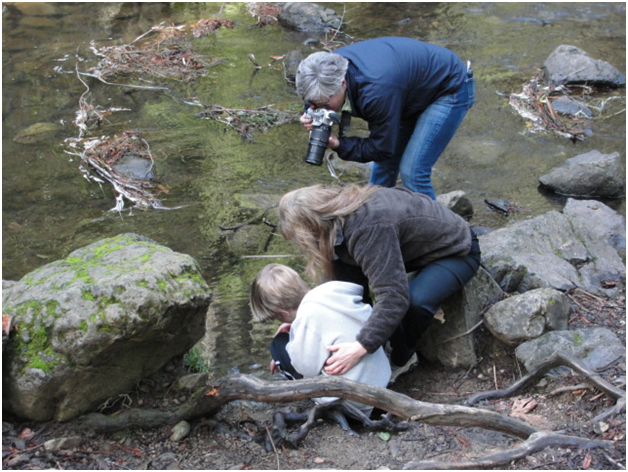 We conduct surveys during all the life stages of salmon while they are in Lagunitas Creek: juveniles (a.k.a. fry, young-of-the-year, parr or fingerlings); adult spawners; and smolts (the stage when they migrate to the ocean). There is positive news to report on the coho population in particular. At all three life stages, the coho in Lagunitas have shown an increase from the scary-low numbers of three and four years ago. The coho spawner run this past winter approached our long-term average of about 500 adults. This doesn’t mean that their recovery is complete, but it is a huge improvement over what had been characterized as an extinction vortex. We have been successful at obtaining grants to help us implement habitat enhancement projects and assessments. We have implemented road drainage improvement projects, to reduce sediment from entering fish-bearing streams, and conducted assessments on all of the unpaved roads in the Lagunitas Creek watershed. Our current and very exciting approach to habitat enhancement is to improve habitat conditions during the winter to increase survival of coho and steelhead. This approach has the potential to increase the populations above the long-term average. We are hardly working alone on these efforts. This work takes the support of the entire staff at MMWD and the Board of Directors. We also collaborate with a host of other agencies, organizations and individuals (including homeowners) who are equally as dedicated as MMWD, and we appreciate their participation. We all have more to do. 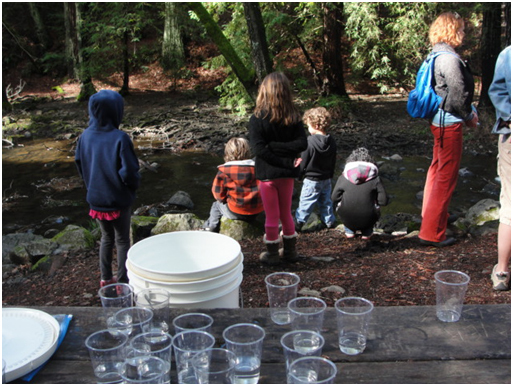 An elementary school student with a parent volunteer, releasing trout into Lagunitas Creek. 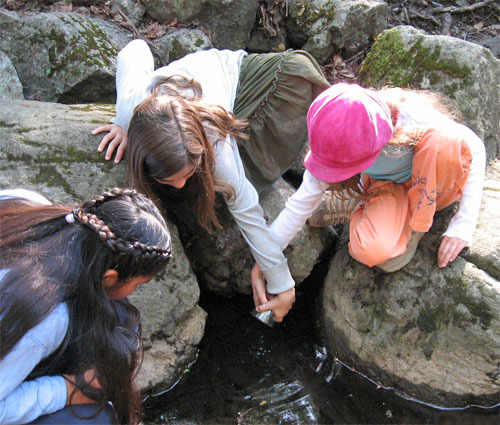 MMWD is a partner with the California Department of Fish and Game, Trout Unlimited and local schools to bring biology and nature to Marin kids through the Trout in the Classroom program. The program gives children the opportunity to raise and learn about the life history and habitat requirements of rainbow trout and salmon. Aquariums are set up in classrooms, trout eggs are delivered to each class, and the kids watch the eggs hatch and raise the baby fish until they grow to fingerling size. Then the kids take a field trip to MMWD’s Lake Lagunitas Picnic Area where they release the fish into a stream that flows between Lake Lagunitas and Bon Tempe Reservoir. A class preparing for their fish release at the Lake Lagunitas Picnic Site. On May 23, the program was recognized on a national level when the American Fisheries Society (AFS) presented an award for excellence in creating community-based Aquatic Education Programs to the State Fish and Game Commission. California was selected by AFS to receive this award for the creative approach, dynamic partnerships and sheer number of children impacted by this program. In Marin County alone, over 1,000 elementary and middle school students are now participating in the program each year. State-wide, approximately 1,000 classrooms are involved—that’s over 20,000 children, not to mention the teachers and parent volunteers. There are 80 Marin County classrooms involved and 380 around San Francisco Bay. The award was accepted by Fish and Game Deputy Director Jordan Traverso and Classroom Aquarium Education Program Chair Ethan Rotman. MMWD has a small role but we are still beaming with pride over the award. Really though, it is the teachers and kids who make this program such a great success. I recently had the honor of travelling to Sacramento to present testimony to the Joint Legislative Committee on Fisheries and Aquaculture, who held a hearing on the status of imperiled coho salmon in California. The hearing, entitled Coho Salmon on the Brink: Understanding the Depth of the Crisis and Recovery Strategies, was called by Committee Chair Assemblymember Wesley Chesbro (First Assembly District). I was one of thirty speakers who presented testimony on the status of coho, the factors that have led to their dramatic decline, and the actions that are being taken to recover the populations. Unfortunately, it was a pretty gloomy picture with almost no good news about the status of coho. By our good fortune, Lagunitas Creek has supported one of the largest and most stable populations of coho in the state, but here, too, the coho population has plummeted over the past three years. Where just six years ago we saw over 1,300 adult coho return to spawn, we have seen less than 200 in each of the past three years, and as few as 43 adults in 2008/09. In my testimony, where I could I did try to be positive about the prospects for coho. I made the point that we have seen the coho in Lagunitas Creek show an ability to recover from relatively low numbers. For example, we have documented one year class of coho increase from 360 adults in 1995/96 to over 1,300 in 2004/05, even though that year class is back down to very low numbers now. Coho populations have declined sharply and are influenced by many phenomena, including ocean conditions, floods, access to habitat and habitat quality. Habitat enhancement efforts, throughout the watershed, stand the best chance of increasing coho populations and preventing their extinction. Right now, time is not on our side. Coho have come to the brink of extinction, but they can recover. Impediments to restoration MUST be broken down to get restoration projects in place sooner: State and federal permitting should be streamlined, and the funding process needs to be shortened. The state has been very active and should continue to lead and support restoration efforts. Part 1: http://www.calchannel.com/channel/viewVideo/2906 – My testimony comes at about the one hour, fifty minute mark of this recording (1:50). A trout fry is released. Over the last month, 61 classes from Marin County’s elementary and middle schools have been releasing trout that they hatched and raised for two months in their classrooms as part of the Trout in the Classroom program, a partnership between Marin’s public and private schools, the California Department of Fish and Game (DFG), Trout Unlimited, and Marin Municipal Water District. 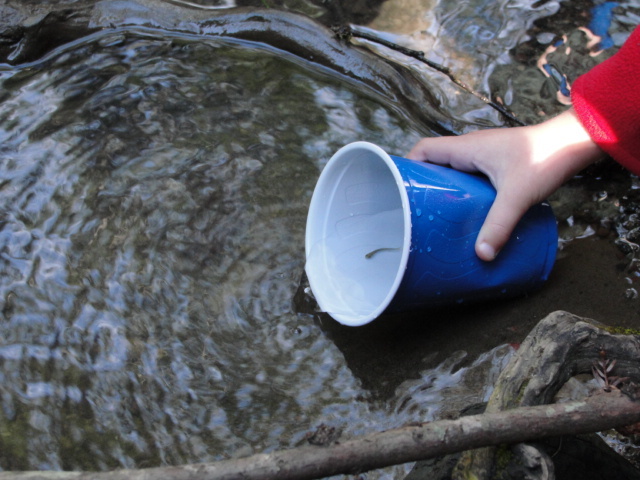 Trout in the Classroom is a national program designed to help school kids learn about the value of aquatic environments, the balance that must be met to maintain and preserve fisheries and aquatic habitats, and how their personal actions affect these valuable resources. The program gives children the opportunity to raise and learn about the life history and habitat requirements of rainbow trout and salmon. 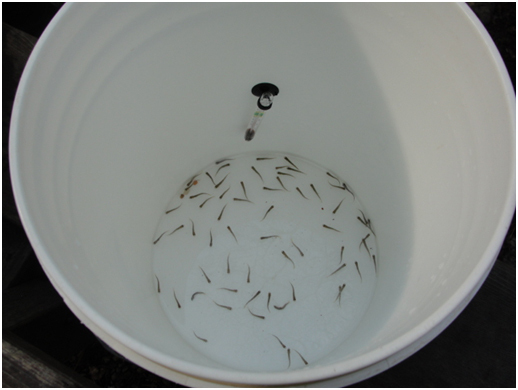 Aquariums are set up in classrooms, trout eggs are delivered to each class (provided by the local DFG hatchery), the eggs develop and hatch, and the kids raise the baby fish for about two months until they grow to fingerling size. Then the kids release the young fry into Lake Lagunitas, Bon Tempe Lake, Phoenix Lake or Scottsdale Pond. 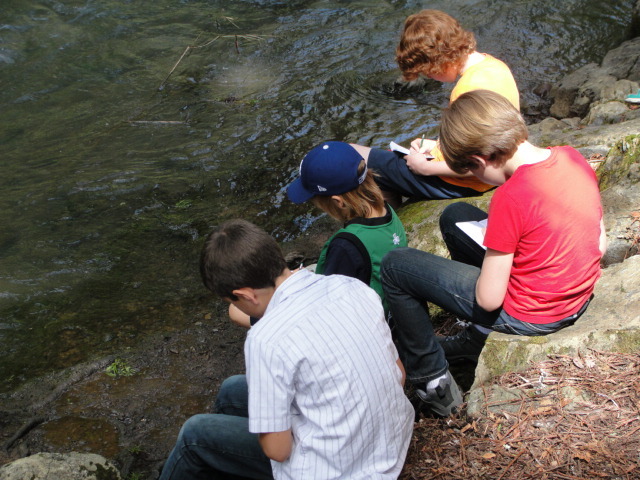 After releasing the trout, the kids write in their journals about the experience. The program in Marin has been running for five years and has grown from 24 classes during the 2006-2007 school year to 61 classes during 2010-2011. More than 1,200 kids participated in the program this year, as did their teachers and many parent volunteers. Also this year, Marin County Superintendent of Schools Mary Jane Burke traveled to the watershed on a rainy day and released a fish! The program is coordinated by DFG’s Fishing-in-the-City staff. Trout Unlimited volunteers do the brunt of the work with the classes by setting up and checking on the aquariums and acting as mentors to the teachers and students. MMWD initially helped purchase the aquariums and chillers for the classrooms, and district staff have assisted with the program each year. MMWD’s fishery biologists provide training to the teachers, giving them a presentation on salmon and trout ecology. They also help to coordinate the fish release field trips, which is a highlight of the year. Teachers say the kids are both happy and a little sad to release their fish, who many have named and even written poems about. They all seem to enjoy their field trip to the release site and are thrilled to see their fish swim away, heading to a life downstream. I am covering the update for Eric this week so bear with me and I’ll just hit the high points. We were able to get into San Geronimo Creek and Devil’s Gulch on Christmas Eve Day and Christmas Day and into mainstem Lagunitas Creek this week. Visibility was fair at best during the surveys so we undoubtedly missed seeing some fish, but the riffles were visible and I think we probably observed all of the redds that were present. There were live coho and new redds in all of the stream segments, but the fish we observed had wear marks, indicating that they had been in the system for a while and had not recently migrated up from Tomales Bay. We will get out when we can next week to see if the storm on Tuesday night brought in new spawners. Since Christmas Eve Day, MMWD and National Park Service biologists have documented over 40 live coho and nine new coho redds, along with nine coho carcasses. Totals for the season are 148 live coho, 74 coho redds and 16 coho carcasses. About half of the coho and redds have been in San Geronimo Creek and about 10 percent have been in Devil’s Gulch; in both tributaries we have observed the coho nearly as far upstream as we go during our surveys. Kent Lake started spilling on Wednesday which will make continuing surveys in mainstem Lagunitas Creek interesting, to say the least. We might not be able to get back into mainstem Lagunitas until there is a good long break in the storms. We may not get into the lowest reaches of Lagunitas at all this season. On a side note, evidence of Santa’s sleigh crashing through Samuel P. Taylor Park was reported by Park Rangers. Must have been the punch. Trout in the Classroom is a national program designed to help school kids learn about the value of aquatic environments, the balance that must be met to maintain and preserve fisheries and aquatic habitats, and how their personal actions affect these valuable resources. In Marin, the program is a school-based partnership between the California Department of Fish and Game, Marin’s public and private schools, Trout Unlimited, and MMWD. The program gives children the opportunity to raise and learn about the life history and habitat requirements of rainbow trout and salmon. Aquariums are set up in classrooms, trout eggs are delivered to each class (provided by the local Fish and Game hatchery), the eggs develop and hatch, and the kids raise the baby fish for about two months, until they grow to fingerling size. 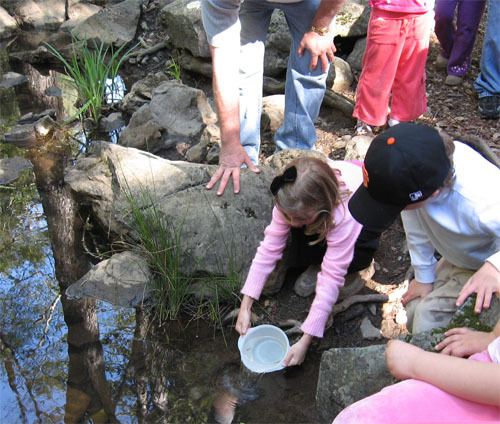 Then the kids take a field trip to MMWD’s Lake Lagunitas Picnic Area where they release the fish into a stream that flows between Lake Lagunitas and Bon Tempe Reservoir. The program in Marin has been running for five years and has grown from 24 classes in 2006 to 55 classes in 2010, with well over 500 kids participating. It is coordinated by Fish and Game’s Fishing-in-the-City staff. Trout Unlimited volunteers do the brunt of the work with the classes by setting up and checking on the aquariums and acting as mentors to the teachers and students. MMWD helped purchase the aquariums and chillers for the classrooms, and district staff have assisted with the program. MMWD’s fishery biologists provide training to the teachers, giving them a presentation on salmon and trout ecology. They also help to coordinate the fish release field trips, which is a highlight of the year. Seeing the elementary school kids give names to the fish, recite poems they have written for the fish, and talk about what they have learned through the experience is a real thrill and equally as memorable for us as it is for the kids. To learn more, click here to watch a video about the program produced by Trout Unlimited.